UDP-glucuronosyltransferase 2B7 (UGT2B7) is involved in the glucuronidation of a wide array of clinically important drugs and endogenous compounds in humans. The aim of this study was to identify an isoform-selective probe substrate that could be used to investigate genetic and environmental influences on glucuronidation mediated by UGT2B7. Three potential probe substrates [3′-azido-3′-deoxythymidine (AZT), morphine, and codeine], were evaluated using recombinant UGTs and human liver microsomes (HLMs; n = 54). 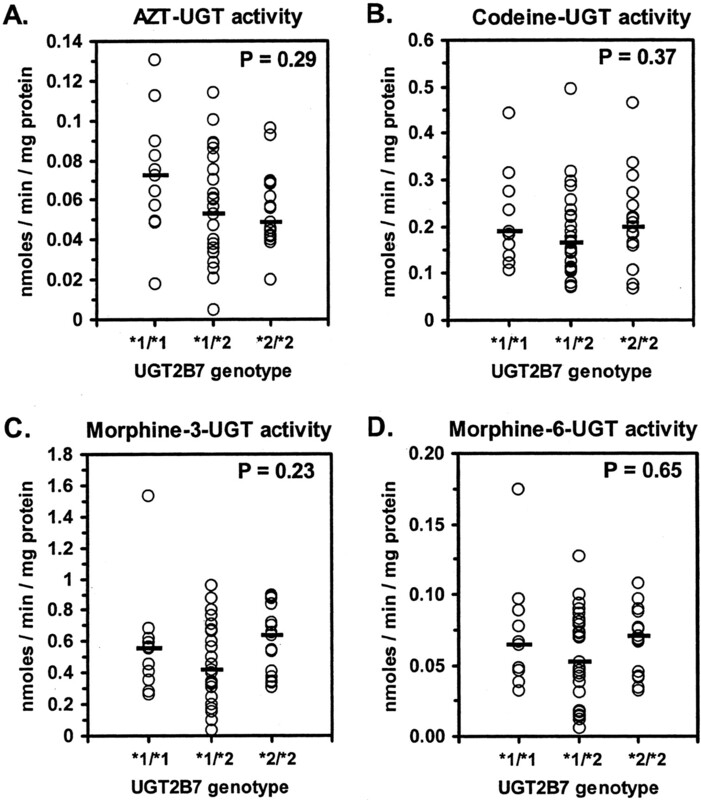 Of 11 different UGTs screened, UGT2B7 was the principal isoform mediating AZT glucuronidation, morphine-3-glucuronidation, and morphine-6-glucuronidation. Codeine was glucuronidated equally well by UGT2B4 and UGT2B7. Enzyme kinetic analysis of these activities typically showed higher apparent Km values for HLMs (pooled and individual) compared with UGT2B7. This difference was least (less than 2-fold higher Km) for AZT glucuronidation and greatest (3- to 6-fold higher Km) for codeine glucuronidation. Microsomal UGT2B7 protein content correlated well with AZT glucuronidation (rs = 0.77), to a lesser extent with morphine-3-glucuronidation (rs = 0.50) and morphine-6-glucuronidation (rs = 0.51), but very weakly with codeine glucuronidation (rs = 0.33). Livers were also genotyped for the UGT2B7*2 (H268Y) polymorphism. No effect of genotype on microsomal glucuronidation or UGT2B7 protein content was observed. In conclusion, although both AZT and morphine can serve as in vitro probe substrates for UGT2B7, AZT appears to be more selective than morphine. Codeine is not a useful UGT2B7 probe substrate because of significant glucuronidation by UGT2B4. The UGT2B7*2 polymorphism is not a determinant of glucuronidation of AZT, morphine, or codeine in HLMs. UDP-glucuronosyltransferase (UGT)1 2B7 is involved in the glucuronidation of a wide range of clinically important drugs in humans including morphine, codeine, and other opioids, 3′-azido-3′-deoxythymidine (AZT), nonsteroidal anti-inflammatory drugs, valproate, fibrates, chloramphenicol, and epirubicin (Jin et al., 1993; Coffman et al., 1998; Barbier et al., 2000; Innocenti et al., 2001). Furthermore, this enzyme may play a substantial role in the metabolism of endogenous substrates including steroids (Turgeon et al., 2001) and retinoids (Samokyszyn et al., 2000). Consequently, interindividual variation in the functioning of this enzyme, either as the result of environmental or genetic influences, is likely to have important consequences for human health with respect to susceptibility for adverse drug reactions and disease. Characterization of the determinants of interindividual variation in UGT2B7 will require identification and validation of specific probe substrates for this enzyme that can be used (ideally) for both in vitro and in vivo studies. Morphine, codeine, and AZT are commonly used drugs that could potentially serve as UGT2B7 probes. However, the specificity of each of these drugs as UGT2B7 substrates has yet to be substantiated using either human tissues or subjects. Current evidence indicates that UGT2B7 is the principal isoform mediating morphine glucuronidation at both 3-hydroxyl and 6-hydroxyl positions in human liver microsomes (HLMs) (Coffman et al., 1997, 1998). Apparent Km values for both morphine-3 and morphine-6-glucuronidation by expressed UGT2B7 are similar to, although somewhat lower (by 2- to 3-fold) than, apparent Km values for HLMs. Furthermore, the ratio of morphine-3-glucuronidation to morphine-6-glucuronidation activities measured using expressed UGT2B7 (about 7:1) is similar to ratios measured in HLMs (about 6:1) (Yue et al., 1990; Coffman et al., 1997, 1998). On the other hand, detailed enzyme kinetic analysis of morphine-3-glucuronidation by HLMs has indicated the possible contribution of multiple high- and low-affinity UGT isoforms (Miners et al., 1988). Very low morphine glucuronidation activities have also been reported for UGT1A3 (Green et al., 1998), but not for any other isoform. 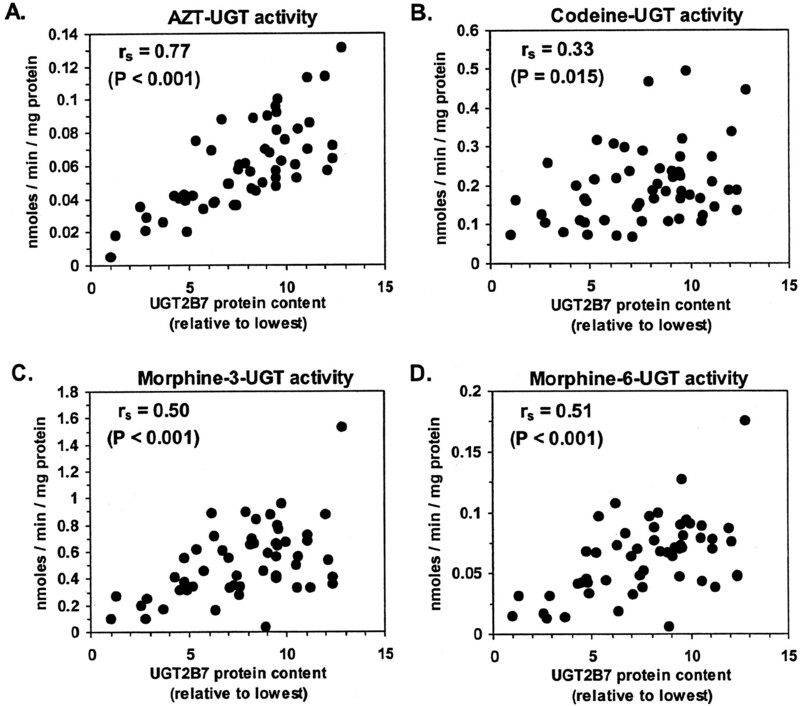 Evidence that AZT and codeine are selective UGT2B7 substrates is much less convincing. Screening of six different UGT2B isoforms showed AZT glucuronidation activity for UGT2B7, but not for UGTs 2B4, 2B10, 2B11, 2B15, or 2B17 (Barbier et al., 2000). However, available UGT1A isoforms were not evaluated, and apparent Km values for AZT glucuronidation by UGT2B7 were 24 to 160 times lower than values previously reported for HLMs (Haumont et al., 1990; Rajaonarison et al., 1991; Resetar et al., 1991). Codeine is glucuronidated by UGT2B7, but with activities that are less than 5% that of morphine-3-glucuronidation (Coffman et al., 1998). Again, apparent Km values for codeine glucuronidation by UGT2B7 were also 2 to 15 times lower compared with HLMs (Yue et al., 1990) As yet, no other UGT isoforms are reported to have codeine glucuronidation activity. A genetic polymorphism in the UGT2B7 gene has been identified that results in either a histidine or tyrosine at amino acid 286 (H268Y) of the UGT2B7 protein, referred to as UGT2B7*1 or UGT2B7*2, respectively (Bhasker et al., 2000). The effect of this mutation on glucuronidation of a variety of drugs has been studied by various groups using recombinant UGT2B7*1 and UGT2B7*2. Significant differences between variants in enzyme kinetic parameters or activities have not been observed for most drugs evaluated, including morphine and codeine (Coffman et al., 1998; Innocenti et al., 2001). However, the cell preparations used to determine these activities differed in UGT2B7 protein content (approximately 2 times higher for UGT2B7*1 versus UGT2B7*2 by immunoblot), and it is not clear whether activities were corrected for this difference. Using AZT as substrate, a third group has shown no differences in apparent Km values between variants; however, Vmax values were 2-fold higher for UGT2B7*1 compared with UGT2B7*2 when normalized to UGT2B7 protein content (Barbier et al., 2000). The effect of this polymorphism on glucuronidation of menthol, androsterone, and morphine has also been investigated using HLMs (Bhasker et al., 2000). Although there were no statistically significant differences in glucuronidation activities between genotyped livers, a trend toward lower morphine-3-glucuronidation activity in HLMs with the UGT2B7*2 allele was suggested. In conclusion, AZT, morphine, and codeine are potentially useful substrate probes for the study of UGT2B7. The aim of this study was to evaluate the specificity of these drugs as UGT2B7 substrates using recombinant UGTs and HLMs (n = 54). The possible influence of the UGT2B7*2 polymorphism on UGT2B7 protein content and glucuronidation was also evaluated by genotyping the livers used to prepare the HLMs. Reagents. Unless otherwise indicated, most chemicals including the glucuronides of AZT, morphine, codeine, and estradiol were purchased from Sigma-Aldrich (St. Louis, MO). Acetonitrile was from Fisher Scientific Co. (Fairlawn, NJ). Oxazepam and oxazepam glucuronide were gifts from Wyeth-Ayerst (Princeton, NJ). Serotonin glucuronide was biologically synthesized by incubation of liver microsomes with serotonin and UDP-glucuronic acid, purified by high-performance liquid chromatography (HPLC), and identity verified by HPLC-mass spectrometry and H1 nuclear magnetic resonance spectroscopy as previously described (Krishnaswamy et al., 2003b). Baculovirus-expressed UGTs 1A1, 1A3, 1A4, 1A6, 1A8, 1A9, 2B4, 2B7, 2B15, and 2B17 were obtained from BD Gentest (Woburn, MA), whereas UGTs 1A7 and 1A10 were from PanVera Corp. (Madison, WI). The glucuronidation activity of each of the expressed UGTs was substantiated by the respective manufacturers using the following substrates: bilirubin and estradiol (UGT1A1); 7-hydroxy-4-trifluoromethylcoumarin (UGTs 1A3, 1A8, 1A10, 2B4, and 2B15); trifluoperazine (UGT1A4); 1-naphthol (UGTs 1A6 and 1A10); propofol (UGT1A9); morphine (UGT2B7); octyl-gallate (UGT1A7); and eugenol (UGT2B17). In addition, immunoblotting with an antibody specific for the conserved C-terminal region of all UGT1A isoforms (WB-UGT1A; BD Gentest) showed that the content of immunodetectable UGT protein was similar for all the expressed UGT1A isoforms used. Human Liver Microsomes. Liver samples from 54 individuals had been obtained from various sources, including the International Institute for the Advancement of Medicine (Exton, PA), the National Disease Research Interchange (Philadelphia, PA), and the University of Minnesota Liver Tissue Procurement and Distribution System (Minneapolis, MN). All livers were either intended for transplantation but had failed to match the tissue or were normal tissue adjacent to surgical biopsies. Donors were primarily white (n = 48), but also included 4 African-Americans and 2 Hispanics. Other available information included gender (16 females, 38 males) and age (median 41 years; range 2 to 75 years). Microsomes were prepared by differential centrifugation as previously described (Court and Greenblatt, 1997b). The resultant pellet was reconstituted in 20% glycerol, pH 7.5, 100 mM phosphate buffer, aliquoted and stored at -80°C. Protein concentrations were measured using the bicinchoninic acid assay (Pierce Chemical, Rockford, IL). The quality of the liver samples was ascertained by reference to at least 10 other UGT and P450 enzyme activities measured in this laboratory using the same set of liver samples. Livers that consistently showed low activity values (>2-fold lower for all measured activities) relative to the median activity value for the entire liver set were excluded from further study. AZT Glucuronidation Assay. An in vitro glucuronidation assay using AZT as substrate was developed based on methods previously used in this laboratory (Court and Greenblatt, 1997a, b). Incubations (100 μl) were performed in 50 mM phosphate buffer (pH = 7.5) at 37°C, 5 mM MgCl2, and 5 mM UDPGA. AZT concentration was 500 μM for correlation studies and between 100 μM and 10 mM for kinetic studies. Alamethicin was also included in incubations at a concentration (50 μg/mg of protein) determined in preliminary experiments to result in greatest activation. Incubation time (up to 240 min) and protein concentration (up to 1.0 mg/ml) at a substrate concentration of 500 μM were also established in preliminary studies to be within initial rate conditions. Incubations were terminated by addition of 50 μl of acetonitrile, vortexed, and placed on ice. After addition of the internal standard (50 nmol of 3-acetamidophenol), the samples were centrifuged, and supernatants were transferred to HPLC tubes and partially dried down in a vacuum oven at 45°C for 15 min before HPLC analysis. HPLC apparatus (Agilent Technologies 1100, Palo Alto, CA) consisted of an autoinjector, binary pump, column, and UV absorbance detector set at a wavelength of 266 nm. Chromatographic separation was performed using a C18 column (4.6 mm × 25 cm, 10 μm Synergi Hydro-RP; Phenomenex, Torrance, CA). The mobile phase was a mixture of 20 mM, pH 2.2, potassium phosphate buffer in water (solution A) and acetonitrile/5% water (solution B) at a flow rate of 1 ml/min. The solvent elution program consisted of an initial isocratic mobile phase mix (15% solution B) for 10 min, followed by a linear gradient from 15 to 50% solution B over 10 min. Analyte retention times were 7 min for AZT glucuronide, 8 min for 3-acetamidophenol (internal standard), and 11 min for AZT, and were confirmed by reference to authentic standards. Metabolite concentrations in the incubate were determined using a standard curve of peak area ratios (normalized to the internal standard) and generated by HPLC analysis of a series of known concentrations of AZT glucuronide dissolved in incubation buffer. Enzyme activities were then calculated by dividing metabolite concentration by protein concentration and incubation time and expressed as nanomoles per minute per milligram of protein. Codeine Glucuronidation Assay. Codeine glucuronidation activities were also measured using a technique similar to that described for AZT glucuronidation with the following exceptions. Codeine concentration was 1 mM for correlation studies and between 50 μM and 10 mM for kinetic studies. Initial rate conditions were confirmed for up to 120 min of incubation time, and up to 1.0 mg/ml protein concentration at a substrate concentration of 500 μM. Alamethicin was included in incubations at a concentration of 100 μg/mg of protein. The internal standard was 400 nmol of AZT. After transfer of incubate supernatants to HPLC tubes, samples were completely dried down in a vacuum oven at 45°C for 30 min and then reconstituted with 100 μl of water. HPLC output was monitored using a UV detector set at a wavelength of 214 nm. The solvent elution program consisted of 10% solution B for the first 14 min, and then a linear gradient from 10 to 70% solution B over 6 min. Analyte retention times, confirmed by authentic standards, were 8 min for codeine-6-glucuronide, 10 min for codeine, and 16 min for the internal standard. Morphine Glucuronidation Assay. Morphine glucuronidation activities were measured using a technique similar to that described for AZT glucuronidation with the following differences. Morphine concentration was 500 μM for correlation studies and between 100 μM and 20 mM for kinetic studies. Initial rate conditions were confirmed for up to 60 min of incubation time and up to 1.0 mg/ml protein concentration at a substrate concentration of 500 μM. The internal standard was 50 nmol of acetaminophen. After transfer of incubate supernatants to HPLC tubes, samples were completely dried down in a vacuum oven at 45°C for 30 min and then reconstituted with 100 μl of water. In addition to the UV detector set at a wavelength of 254 nm for detection of the internal standard, a serially connected fluorescence detector set at 215-nm excitation and 350-nm emission wavelengths was used to monitor morphine and morphine glucuronides. Solvent A was 20 mM potassium phosphate buffer at pH 4.5 (rather than pH 2.2). The solvent elution program consisted of a linear gradient from 0 to 5% solution B over 15 min, which increased to 50% solution B over the next 5 min. Analyte retention times, confirmed by authentic standards, were 5 min for morphine-3-glucuronide, 10 min for morphine-6-glucuronide, 12 min for morphine, and 17 min for the internal standard. Other Glucuronidation Activities. Six other glucuronidation activities (estradiol-3-glucuronidation, trifluoperazine glucuronidation, serotonin glucuronidation, propofol glucuronidation, R- and S-oxazepam glucuronidation) were measured using the same set of human liver microsomes. The incubation conditions and HPLC assay method used have been given in detail previously (Court et al., 2002; Krishnaswamy et al., 2003a). Substrate concentrations were 100 μM for estradiol, 200 μM for trifluoperazine, 4 mM for serotonin, 100 μM for propofol, and 100 μM for R- and S-oxazepam. These concentrations were chosen to approximate Km values for HLMs. Since propofol glucuronide and trifluoperazine glucuronide were not available, the identity of glucuronide HPLC peaks was verified by HPLC-mass spectrometry (Agilent Technologies 1100 MS), and glucuronide concentrations were determined using a standard curve generated using the substrate, assuming similar UV absorbance. where Vmax is the maximal velocity, Km is the substrate concentration at half-maximal velocity, and Ks is an inhibition constant (Venkatakrishnan et al., 2001). The model chosen to best represent the data were based on a number of criteria, including visual inspection of data plots (Michaelis-Menten and Eadie-Hofstee), distribution of residuals, size of the sum of squared residuals, and the standard error of the estimates. All kinetic parameters are presented as a regression parameter estimate ± the standard error of the estimate. Nonspecific Microsomal Binding. Nonspecific binding of AZT, codeine, and morphine to pooled human liver microsomes was quantified using a modification of an ultrafiltration method described previously (Yao et al., 2001, 2003). Briefly, tubes were prepared containing microsomes (1 mg/ml) and substrate (100 μM) in 0.5 ml of 50 mM phosphate buffer (pH 7.5) and incubated at 37°C for 2 h. Control incubations containing substrate and buffer without microsomes were used to assess recovery. The incubate was then applied to a centrifugal ultrafiltration device (Ultrafree-MC 10K MW cutoff; Millipore Corporation, Bedford, MA) and centrifuged at 5,000g until 20 to 30% of the initial volume had been filtered (approximately 5–20 min). Substrate concentrations were then determined in upper and lower reservoirs by HPLC as described above. The unbound fraction (fu) was calculated as the ratio of the filtered versus unfiltered drug concentration adjusted for recovery. UGT2B7 Protein Content. The relative content of UGT2B7 protein in hepatic microsomes from the liver bank was determined by adapting an immunoblotting method described previously (Court et al., 2001). Briefly, 4 to 50 μg of microsomal protein was separated by sodium dodecyl sulfate-polyacrylamide gel electrophoresis using a 4 to 15% gradient gel (Bio-Rad, Hercules, CA). Proteins were then electrophoretically transferred to polyvinyl difluoride membrane (Immobilon-P, Millipore Corporation), blocked in 10% powdered nonfat milk in TBS-Tween (0.15 M NaCl, 0.04 M Tris, pH 7.7, and 0.1% Tween 20) and then incubated in TBS-Tween/1% milk containing a 1:1,000 dilution of a polyclonal antipeptide UGT2B7 antibody (WB-UGT2B7; BD Gentest). After washing, the blots were incubated in a 1:10,000 dilution of horseradish peroxidase-conjugated secondary antibody (Sigma-Aldrich) and washed, and chemiluminescence reagent was applied (Super Signal; Pierce Chemical). Blots were imaged (Kodak Image Station 440CF; Eastman Kodak Co., Rochester, NY), and bands were quantified using Kodak 1D Image Analysis Software (Eastman Kodak Co.). The linearity of the measurements under the conditions used was established by loading serial dilutions of microsomes from high- and low-AZT glucuronidation activity livers and recombinant UGT2B7. Each blot contained a standard curve generated by using serial dilutions of UGT2B7. After normalizing for microsomal protein loading, values were expressed relative to the liver with the lowest UGT2B7 content. UGT2B7 Genotyping. Livers were genotyped for the UGT2B7*2 polymorphism by PCR-RFLP analysis of genomic DNA and confirmed by direct sequencing of PCR product. Briefly, genomic DNA was prepared from liver tissue by DNAZOL extraction (Invitrogen, Carlsbad, CA). Typical 50-μl PCR reactions contained 100 ng of genomic DNA, 2 mM MgCl2, 0.2 mM dNTPs, 10 μl of 10× PCR buffer, primers, and 2.5 U of TaqDNA polymerase (Platinum Taq; Invitrogen). Amplification primers included a sense primer (PRI-122, 5′-TTATGATTATGAGCATACTGATGC-3′) and an antisense primer (PRI-123, 5′-TACTTGCACATATTCTATCTTTTG-3′). PCR was performed in a thermal cycler (GeneAmp 9600; Applied Biosystems, Foster City, CA) using an initial denaturation cycle of 94°C for 4 min, then 40 cycles of 94°C for 30 s, 62°C for 30 s, and 72°C for 30 s, followed by a final extension cycle of 72°C for 15 min. An aliquot (10 μl) of the resultant 829-base pair PCR product was then digested with 4 units of Fok I (New England Biolabs, Beverly, MA) in a final 20-μl volume for 60 min at 37°C. Digestion fragments were then analyzed by electrophoresis in an ethidium bromide-stained 1.5% agarose gel. Three Fok I sites are present in the UGT2B7*1 allele PCR product, which result in 112-, 150-, 221-, and 346-bp fragments after digestion (Fig. 1). The UGT2B7*2 allele eliminates one of the Fok I sites (between the 112- and 346-bp fragments) with resultant 150-, 221-, and 458-bp fragments with digestion. The presence of both alleles in heterozygous livers results in five fragments (112, 150, 221, 346, and 458 bp). This assay was confirmed by direct sequencing (ABI Prism 3100; Applied Biosystems) of the initial 829-bp PCR product from 10 representatives of each genotype using a separate sequencing primer (PRI-124, 5′-CCTGTCAGGAAGACCCACTA-3′). PCR-RFLP assay used to genotype livers for the UGT2B7*2 (H268Y) polymorphism. An 829-bp fragment of genomic DNA was amplified by PCR and subjected to a 1-h incubation at 37°C with the restriction enzyme Fok I and digestion products analyzed on a 1.5% agarose gel. A, the UGT2B7*1 allele is predicted to contain three Fok I sites in this fragment, whereas the UGT2B7*2 allele only contains two sites. 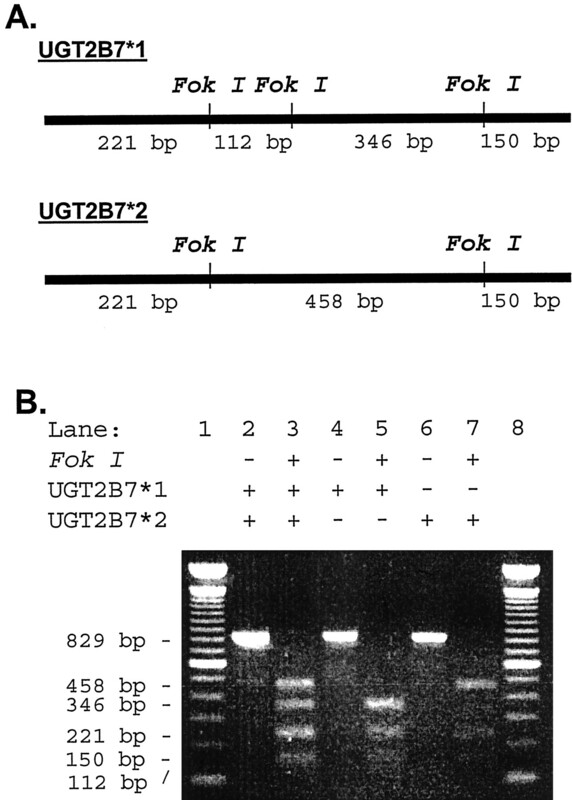 B, PCR products before (lanes 2, 4, and 6) and after (lanes 3, 5, and 7) digestion with Fok I from representative livers that were homozygous for UGT2B7*1 (lanes 4 and 5), heterozygous (lanes 2 and 3), and homozygous for UGT2B7*2 (lanes 6 and 7). Lanes 1 and 8 contain a 100-bp DNA sizing standard (Invitrogen). As expected, the homozygous UGT2B7*1 liver contained a 346-bp fragment (lane 5) and the homozygous UGT2B7*2 liver contained a 458-bp fragment (lane 7), whereas the heterozygous liver contained both 346- and 458-bp fragments (lane 3). Statistical Analysis. Statistical analyses were performed using the Sigmastat software package (SPSS Science, Chicago, IL). All activities were measured in duplicate and averaged. The potential influence of UGT2B7 genotype on UGT2B7 protein content and glucuronidation activities was evaluated by Kruskal-Wallis one-way ANOVA on ranks. A P value less than or equal to 0.05 was considered statistically significant. Spearman correlation analysis was used to examine the relationships between UGT2B7 protein content and each of the glucuronidation activities measured. For these analyses, a Spearman correlation coefficient (rs) value greater than or equal to 0.5 with a P value of less than 0.001 was considered statistically significant. 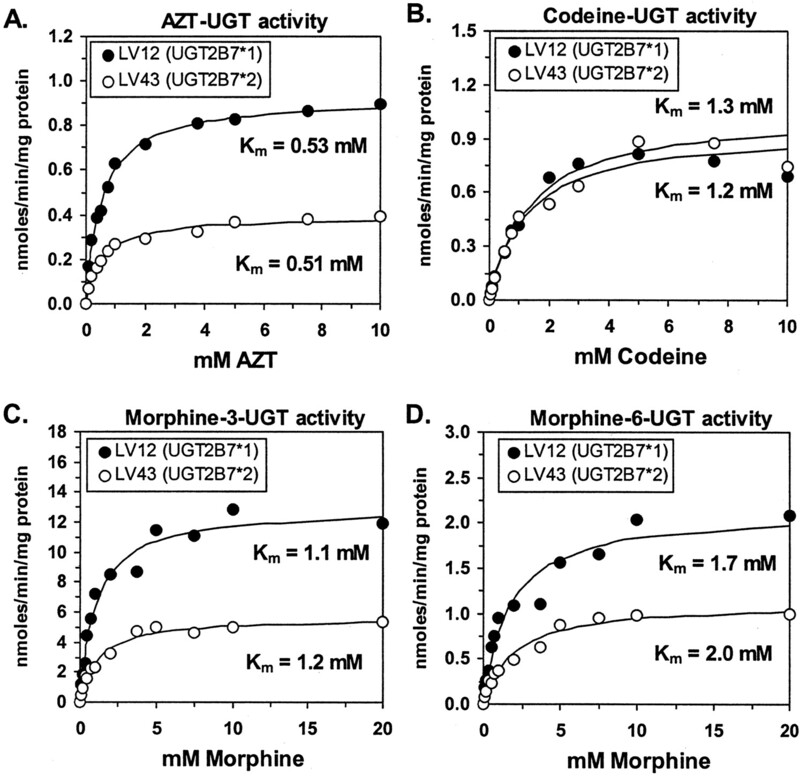 AZT, Codeine, and Morphine Glucuronidation by Expressed UGTs. All commercially available recombinant UGTs were screened for AZT glucuronidation, morphine-3-glucuronidation, morphine-6-glucuronidation, and codeine glucuronidation activities using aglycone concentrations predicted to span apparent Km values for HLMs for each activity (Fig. 2). The extrahepatic isoform UGT1A8 was not evaluated for AZT glucuronidation or morphine glucuronidation, since it was not available at the time those assays were conducted. As shown in Fig. 2, UGT2B7 was the predominant UGT isoform mediating AZT glucuronidation and morphine-3-glucuronidation with 6- to 10-fold higher activity than any other UGT isoform. Relatively low AZT glucuronidation activities were also observed for UGT2B4 and 2B17 (Fig. 2A) but not for any other isoform studied. Low morphine-3-glucuronidation activities were also observed for UGTs 2B4 and 2B17, as well as for UGTs 1A3, 1A9, 1A10, and 2B15 (Fig. 2C). In addition to UGT2B7, significant morphine-6-glucuronidation activity was also found for UGT2B4 (about 25–30% that of UGT2B7) at both 0.5 and 5 mM morphine concentrations in addition to UGTs 1A1 and 1A3 at 5 mM morphine concentration (Fig. 2D). In contrast, codeine was glucuronidated equally well by UGTs 2B4 and 2B7, but not by any other UGT isoform (Fig. 2B). Glucuronidation of potential UGT2B7 probe substrates by recombinant expressed UGTs. AZT glucuronidation (A), codeine glucuronidation (B), morphine-3-glucuronidation (C), and morphine-6-glucuronidation (D) were measured at two aglycone concentrations (0.5 and 5 mM for AZT and morphine; 1 and 10 mM for codeine) using UGT isoforms expressed in baculovirus-infected insect cells. The height of each bar represents the mean of duplicate determinations. Comparative Enzyme Kinetics. Enzyme kinetic studies were performed with AZT, morphine, and codeine using expressed UGT2B7 and HLMs (pooled from 54 donors). All data were well described by the simple Michaelis-Menten model (Fig. 3), except for codeine glucuronidation by UGT2B7 which was best described by the uncompetitive substrate inhibition model (Fig. 3B). Comparing HLMs with UGT2B7 for all activities, the enzyme kinetic parameters for AZT glucuronidation were the most similar with Km values of 1.4 ± 0.17 mM and 0.77 ± 0.16 mM, respectively, and Vmax values of 0.53 ± 0.021 nmol/min/mg of protein and 0.21 ± 0.012 nmol/min/mg of protein, respectively, representing about a 2- to 2.5-fold difference. For morphine-3-glucuronidation, enzyme kinetic values in HLMs were 4- to 6-fold higher compared with expressed UGT2B7, with Km values of 4.3 ± 0.52 mM and 0.67 ± 0.044 mM, respectively, and Vmax values were 2.7 ± 0.13 nmol/min/mg of protein and 0.65 ± 0.11 nmol/min/mg of protein, respectively. A smaller (3- to 4-fold) disparity was observed for morphine-6-glucuronidation with Km values for HLMs and UGT2B7 of 2.4 ± 0.22 mM and 0.63 ± 0.075 mM, respectively, and Vmax values of 0.28 ± 0.008 nmol/min/mg of protein and 0.099 ± 0.003 nmol/min/mg of protein, respectively. The greatest difference (6- to 9-fold) in kinetic values was seen for codeine glucuronidation with Km values for HLMs and UGT2B7 of 2.6 ± 0.20 mM and 0.40 ± 0.040 mM, respectively, and Vmax values of 0.63 ± 0.033 nmol/min/mg of protein and 0.074 ± 0.004 nmol/min/mg of protein, respectively. Comparative enzyme kinetic analysis of glucuronidation of potential UGT2B7 substrate probes. AZT glucuronidation (A), codeine glucuronidation (B), morphine-3-glucuronidation (C), and morphine-6-glucuronidation (D) activities were measured in pooled HLMs (n = 54) and recombinant UGT2B7 expressed in baculovirus-infected insect cells. Shown are individual data points (mean of duplicate measurements), as well as curves representing best-fit estimates of these data determined by nonlinear regression curve fit to the Michaelis-Menten equation (all data except codeine glucuronidation by UGT2B7) or the substrate inhibition equation (eq. 1). Also shown are the apparent Km estimates for each fit. Nonspecific Microsomal Binding. There was essentially no binding of AZT (fu = 0.95 ± 0.07), morphine (fu = 1.04 ± 0.10), or codeine (fu = 1.01 ± 0.09) to pooled HLMs measured using 100 μM substrate concentration and 1 mg/ml protein concentration. Correlational Analyses. Correlational analyses (Table 1 and Fig. 4) with relative UGT2B7 protein content as the dependent variable showed a relatively strong relationship with AZT glucuronidation (rs = 0.77, P < 0.001) and weaker but significant correlations with morphine-3-glucuronidation (rs = 0.50, P < 0.001) and morphine-6-glucuronidation (rs = 0.51, P < 0.001). No significant correlations were found with codeine glucuronidation (rs = 0.33, P = 0.015) or any other glucuronidation activity measured (rs < 0.43, P > 0.001). Correlation of UGT2B7 protein content with glucuronidation activities Glucuronidation activities and immunoquantified UGT2B7 protein content were measured in the same set of human liver microsomes (n = 54) and compared by Spearman rank order correlation analysis. Values represent the Spearman correlation coefficient (rs), and P value for the indicated comparisons. Correlation of HLM immunoreactive UGT2B7 protein content with glucuronidation activities for potential UGT2B7 probe substrates. Relative UGT2B7 protein contents were determined by immunoblotting a set of HLMs (n = 54) and then correlated with AZT glucuronidation (A), codeine glucuronidation (B), morphine-3-glucuronidation (C), and morphine-6-glucuronidation (D) activities measured in the same set of HLMs. Shown for each comparison is the Spearman rank order correlation coefficient (rs) and P value. Effect of UGT2B7*2 Genotype. Genotyping of the entire set of human livers (n = 54) for the UGT2B7*1/*2 (H268Y) polymorphism identified 11 individuals homozygous for the UGT2B7*1 allele, 25 heterozygous individuals, and 16 individuals homozygous for the UGT2B7*2 allele. A genotype could not be unambiguously assigned to one liver (HL47). These genotype frequencies were consistent with Hardy-Weinberg equilibrium (χ2 = 0.00019, P = 1.00). Allele frequencies were 0.45 for UGT2B7*1 and 0.55 for UGT2B7*2. As shown in Fig. 5, no significant differences between genotype groups could be discerned by ANOVA for AZT glucuronidation (P = 0.29), morphine-3-glucuronidation (P = 0.23), morphine-6-glucuronidation (P = 0.65), or codeine glucuronidation (P = 0.37). Similarly, there were no differences in relative microsomal UGT2B7 protein content (P = 0.25) or AZT glucuronidation normalized to UGT2B7 content (P = 0.37) among UGT2B7 genotype groups (Fig. 6). Effect of the UGT2B7*2 polymorphism on glucuronidation of UGT2B7 substrates in HLMs. UGT2B7*2 genotype, AZT glucuronidation (A), codeine glucuronidation (B), morphine-3-glucuronidation (C), and morphine-6-glucuronidation (D) were determined using genomic DNA and HLMs prepared from the same set of human livers (n = 53). Comparisons between homozygous UGT2B7*1 (*1/*1), heterozygous (*1/*2), and homozygous UGT2B7*2 (*2/*2) livers were then made by ANOVA on ranks. Shown for each set of data are individual data points (mean of duplicate determinations), the median activity of each genotype group (dashed lines), and the P value for each comparison. Effect of the UGT2B7*2 polymorphism on UGT2B7 protein content (A) and AZT glucuronidation activity normalized to UGT2B7 protein content (B) in HLMs. UGT2B7*2 genotype, UGT2B7 protein content, and AZT glucuronidation activity were determined using genomic DNA and HLMs prepared from the same set of human livers (n = 53). UGT2B7 protein content was determined in duplicate by immunoblotting HLMs and band intensity data expressed relative to the liver with the lowest content. AZT glucuronidation activities were then divided by the UGT2B7 content and also expressed relative to the liver with the lowest value. Comparisons between homozygous UGT2B7*1 (*1/*1), heterozygous (*1/*2), and homozygous UGT2B7*2 (*2/*2) livers were then made by ANOVA on ranks. Shown for each set of data are individual data points (mean of duplicate determinations), the median activity of each genotype group (horizontal dash), and the P value for each comparison. Enzyme kinetics for each UGT2B7 substrate were also determined for individual livers genotyped as homozygous UGT2B7*1 (LV12) and homozygous UGT2B7*2 (LV43) (Fig. 7). Km values for LV12 and LV43, respectively, were essentially identical for AZT glucuronidation (0.53 ± 0.03 and 0.51 ± 0.04 mM), codeine glucuronidation (1.3 ± 0.16 and 1.2 ± 0.16 mM), morphine-3-glucuronidation (1.1 ± 0.15 and 1.2 ± 0.14 mM), and morphine-6-glucuronidation (1.7 ± 0.36 and 2.0 ± 0.31 mM). Higher Vmax values for LV12 compared with LV43, respectively, were observed for AZT glucuronidation (0.92 ± 0.01 versus 0.39 ± 0.01 nmol/min/mg of protein), morphine-3-glucuronidation (13 ± 0.5 versus 5.7 ± 0.2 nmol/min/mg of protein), morphine-6-glucuronidation (2.1 ± 0.14 versus 1.1 ± 0.06 nmol/min/mg of protein), but not for codeine glucuronidation (1.0 ± 0.01 versus 0.95 ± 0.01 nmol/min/mg of protein). Enzyme kinetic analysis of glucuronidation of UGT2B7 substrates in livers genotyped for the UGT2B7*2 polymorphism. AZT glucuronidation (A), codeine glucuronidation (B), morphine-3-glucuronidation (C), and morphine-6-glucuronidation (D) activities were measured in HLMs from two individuals genotyped as either homozygous for the UGT2B7*1 allele (LV12) or homozygous for the UGT2B7*2 allele (LV43). Shown are individual data points (mean of duplicate measurements), as well as curves representing best-fit estimates of these data determined by nonlinear regression curve fit to the Michaelis-Menten equation. Also shown are the apparent Km estimates for each fit. Of the three potential probe substrates evaluated, AZT appears to be the most selective UGT2B7 substrate. Extending the results of a previous study (Barbier et al., 2000), AZT glucuronidation was not observed for any of the UGT1A isoforms evaluated. However, in contrast to that study, low but measurable AZT glucuronidation activities were seen with UGT2B4 and 2B17, in addition to UGT2B7. This difference might be the result of relatively greater assay sensitivity (5 pmol/min/mg of protein in this study, but not given in the previous study) or perhaps higher specific activity of the recombinant preparations used (baculovirus-insect cells in this instance versus HEK-293 cells in the previous study). Comparisons of enzyme kinetic parameters between HLMs and recombinant UGT2B7 were made to further evaluate the relative contribution of UGT2B7 to substrate glucuronidation. The ideal UGT2B7 probe substrate would be glucuronidated solely by UGT2B7 and, therefore, should have an identical apparent Km and a relatively high Vmax value for recombinant UGT2B7 compared with HLMs. This was recently found to be the case for serotonin glucuronidation by HLMs and UGT1A6 (Krishnaswamy et al., 2003a). Based on the results of the present study, AZT glucuronidation also appears to fit these criteria in that Km values were essentially identical for UGT2B7 (0.77 mM) and livers LV12 and LV34 (0.53 and 0.51 mM), although somewhat higher for pooled HLMs (1.4 mM). In contrast, more substantial differences in Km values between HLMs and UGT2B7 were observed for morphine-3-and morphine-6-glucuronidation (2- to 6-fold higher) and codeine glucuronidation (3- to 6-fold higher). Such differences probably reflect the contribution of low-affinity isoforms in addition to UGT2B7 to glucuronidation in HLMs. Consequently, relatively high substrate concentrations should be avoided to minimize the contribution of these other isoforms to the measured activity. Although we used identical protein concentrations for the kinetic analyses, the differences in Km values between HLMs and expressed UGT preparations might also be explained by differential nonspecific microsomal binding (Venkatakrishnan et al., 2000, 2001). In particular, there could be greater binding of substrate (AZT, morphine, or codeine) to the microsomal matrix of HLMs than expressed UGTs resulting in a higher apparent Km for HLMs, despite a similar unbound Km for the two preparations. However, this was not the case, in that no binding (fu > 0.95) was observed for AZT, morphine, and codeine using an ultrafiltration method, which is in agreement with values (fu > 0.80) previously reported for these same compounds using an equilibrium dialysis method (Boase and Miners, 2002; Soars et al., 2002). Typically, high nonspecific binding is characteristic of either basic or highly lipophilic drugs (McLure et al., 2000). AZT glucuronidation also showed the highest correlation with UGT2B7 protein content measured in the same set of HLMs with a correlation value (rs = 0.77) essentially identical to the value (rs = 0.77) we previously reported for correlation between serotonin glucuronidation and UGT1A6 protein content in HLMs (Krishnaswamy et al., 2003a). Lower but significant correlation values were also found between UGT2B7 protein and morphine glucuronidation (rs = 0.50–0.51), but not for codeine glucuronidation or any other glucuronidation activity measured (rs < 0.5). Estradiol-3 glucuronidation (Fisher et al., 2000; Patten et al., 2001), trifluoperazine glucuronidation (Dehal et al., 2001), serotonin glucuronidation (Krishnaswamy et al., 2003a), propofol glucuronidation (Ebner and Burchell, 1993), and S-oxazepam glucuronidation (Court et al., 2002) were measured as indicators of glucuronidation by UGT1A1, 1A4, 1A6, 1A9, and 2B15, respectively. Interestingly, R-oxazepam glucuronidation had the highest correlation with UGT2B7 protein (rs = 0.42) after AZT and morphine glucuronidation. R-oxazepam was recently shown to be glucuronidated by UGT2B7 as well as UGT1A9 (Court et al., 2002). Both morphine-3-glucuronidation and morphine-6-glucuronidation were relatively poor indicators of UGT2B7 protein content under the assay conditions used. However, it is possible that the contribution of UGT2B7 to these activities (and isoform selectivity of the activities) might be enhanced at lower morphine concentrations (less than 500 μM), since the apparent Km of UGT2B7 is low relative to the Km of HLMs. Indeed, plasma morphine concentrations in patients following a standard clinical dose of this drug rarely exceed 300 ng/ml, or about 1 μM (Cepeda et al., 2001). Unfortunately, methodological limitations in the sensitivity of the current morphine glucuronidation assay precluded such an analysis in this study. Codeine clearly is not a selective probe substrate for UGT2B7, given that recombinant UGT2B4 was equally (or perhaps more) efficient in this activity. Furthermore, there were relatively large differences in enzyme kinetic parameters between HLMs and recombinant UGT2B7, and there was no significant correlation between UGT2B7 protein content and codeine glucuronidation activity. Involvement of UGT2B4 in codeine glucuronidation, as well as glucuronidation of the other drugs evaluated in this study (AZT and morphine), is a novel finding but not surprising considering the high degree of amino acid sequence homology between UGTs 2B7 and 2B4. Sequence polymorphisms of the UGT2B4 gene coding region have been reported and could potentially contribute to interindividual variability of UGT2B4 substrates such as codeine (Levesque et al., 1999). Previous studies indicate that the UGT2B7*2 polymorphism could negatively impact UGT2B7-mediated glucuronidation through an effect on microsomal UGT2B7 protein content or specific activity (Coffman et al., 1998; Barbier et al., 2000; Bhasker et al., 2000). However, the results from this study do not support this contention. There was no effect of UGT2B7*2 genotype on glucuronidation of any of the UGT2B7 substrates by HLMs. Furthermore, there were no differences in either UGT2B7 protein content or UGT2B7 specific activity (estimated by dividing AZT glucuronidation activity by UGT2B7 protein content) related to UGT2B7*2 genotype. These findings are supported by a recent study that showed no effect of the UGT2B7*2 polymorphism on the ratios of morphine glucuronide (either morphine-3-glucuronide or morphine-6-glucuronide) to morphine concentration in the plasma of patients receiving slow-release oral morphine (Holthe et al., 2002). Consequently, other genetic and environmental factors are likely to explain interindividual variability in glucuronidation of AZT, morphine, and codeine. 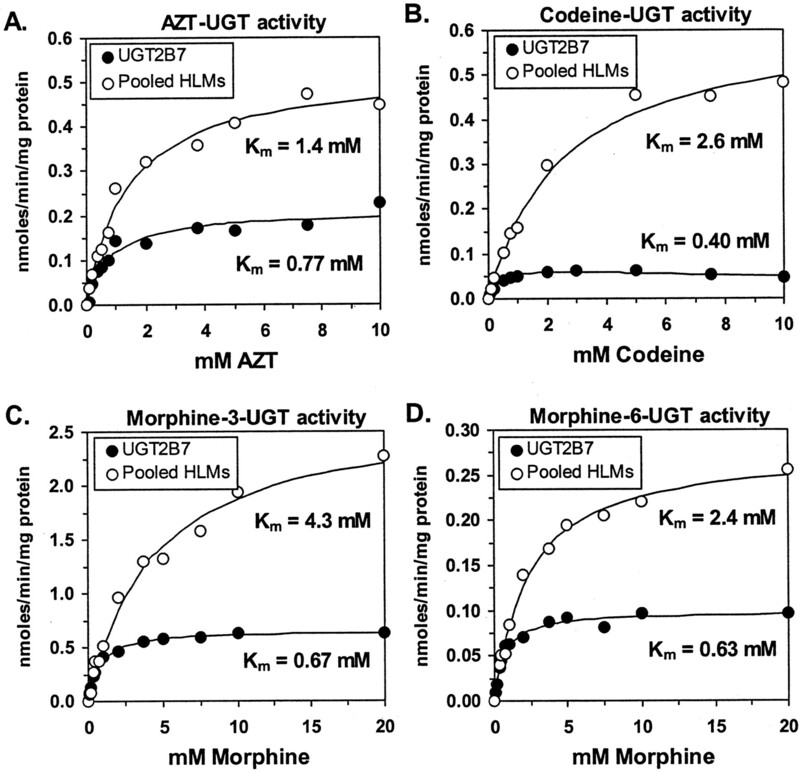 In conclusion, results from this study indicate that both AZT and morphine can serve as isoform-selective probe substrates for UGT2B7, although AZT appears to be more selective as a probe substrate than morphine. Codeine is not a probe substrate for UGT2B7 probably because of significant glucuronidation by UGT2B4. The UGT2B7*2 polymorphism is not a determinant of AZT, morphine, and codeine glucuronidation in HLMs. ↵1 Abbreviations used are: UGT, UDP-glucuronosyltransferase; AZT, 3′-azido-3′-deoxythymidine; HLMs, human liver microsomes; HPLC, high-performance liquid chromatography; UDPGA, UDP-glucuronic acid; TBS, Tris-buffered saline; PCR, polymerase chain reaction; RFLP, restriction fragment length polymorphism; dNTPs, deoxynucleoside-5′-triphosphate; ANOVA, analysis of variance; bp, base pair. This work was supported by Grants GM-61834, DA-05258, MH-58435, DA-13209, DK-58496, AG-17880, AT-01381, and RR-00054 from the National Institutes of Health (Bethesda, MD). Barbier O, Turgeon D, Girard C, Green MD, Tephly TR, Hum DW, and Belanger A (2000) 3′-Azido-3′-deoxythimidine (AZT) is glucuronidated by human UDP-glucuronosyltransferase 2B7 (UGT2B7). Drug Metab Dispos 28: 497-502. Bhasker CR, McKinnon W, Stone A, Lo AC, Kubota T, Ishizaki T, and Miners JO (2000) Genetic polymorphism of UDP-glucuronosyltransferase 2B7 (UGT2B7) at amino acid 268: ethnic diversity of alleles and potential clinical significance. Pharmacogenetics 10: 679-685. Boase S and Miners JO (2002) In vitro-in vivo correlations for drugs eliminated by glucuronidation: investigations with the model substrate zidovudine. Br J Clin Pharmacol 54: 493-503. Cepeda MS, Farrar JT, Roa JH, Boston R, Meng QC, Ruiz F, Carr DB, and Strom BL (2001) Ethnicity influences morphine pharmacokinetics and pharmacodynamics. Clin Pharmacol Ther 70: 351-361. Coffman BL, King CD, Rios GR, and Tephly TR (1998) The glucuronidation of opioids, other xenobiotics and androgens by human UGT2B7Y(268) and UGT2B7H(268). Drug Metab Dispos 26: 73-77. Coffman B, Rios G, King C, and Tephly T (1997) Human UGT2B7 catalyzes morphine glucuronidation. Drug Metab Dispos 25: 1-4. Court MH, Duan SX, Guillemette C, Journault K, Krishnaswamy S, Von Moltke LL, and Greenblatt DJ (2002) Stereoselective conjugation of oxazepam by human UDP-glucuronosyltransferases (UGTs): S-oxazepam is glucuronidated by UGT2B15, while R-oxazepam is glucuronidated by UGT2B7 and UGT1A9. Drug Metab Dispos 30: 1257-1265. Court MH and Greenblatt DJ (1997a) Biochemical basis for deficient paracetamol glucuronidation in cats: an interspecies comparison of enzyme constraint in liver microsomes. J Pharm Pharmacol 49: 446-449. Court MH and Greenblatt DJ (1997b) Molecular basis for deficient acetaminophen glucuronidation in cats. An interspecies comparison of enzyme kinetics in liver microsomes. Biochem Pharmacol 53: 1041-1047. Dehal SS, Gange PV, Crespi CL, and Patten CJ (2001) Characterization of a probe substrate and an inhibitor of UDP-glucuronosyltransferase 1A4 activity in human liver microsomes and cDNA-expressed UGT-enzymes (Abstract). Drug Metab Rev 33: 162. Ebner T and Burchell B (1993) Substrate specificities of two stably expressed human liver UDP-glucuronosyltransferases of the UGT1 gene family. Drug Metab Dispos 21: 50-55. Fisher MB, Vandenbranden M, Findlay K, Burchell B, Thummel KE, Hall SD, and Wrighton SA (2000) Tissue distribution and interindividual variation in human UDP-glucuronosyltransferase activity: relationship between UGT1A1 promoter genotype and variability in a liver bank. Pharmacogenetics 10: 727-739. Green MD, King CD, Mojarrabi B, Mackenzie PI, and Tephly TR (1998) Glucuronidation of amines and other xenobiotics catalyzed by expressed human UDP-glucuronosyltransferase 1A3. Drug Metab Dispos 26: 507-512. Haumont M, Magdalou J, Lafaurie C, Ziegler JM, Siest G, and Colin JN (1990) Phenobarbital inducible UDP-glucuronosyltransferase is responsible for glucuronidation of 3′-azido-3′-deoxythymidine: characterization of the enzyme in human and rat liver microsomes. Arch Biochem Biophys 281: 264-270. Holthe M, Klepstad P, Zahlsen K, Borchgrevink PC, Hagen L, Dale O, Kaasa S, Krokan HE, and Skorpen F (2002) Morphine glucuronide-to-morphine plasma ratios are unaffected by the UGT2B7 H268Y and UGT1A1*28 polymorphisms in cancer patients on chronic morphine therapy. Eur J Clin Pharmacol 58: 353-356. Innocenti F, Iyer L, Ramirez J, Green MD, and Ratain MJ (2001) Epirubicin glucuronidation is catalyzed by human UDP-glucuronosyltransferase 2B7. Drug Metab Dispos 29: 686-692. Jin C, Miners J, Lillywhite K, and Mackenzie P (1993) Complementary deoxyribonucleic acid cloning and expression of a human liver uridine diphosphate-glucuronosyltransferase glucuronidating carboxylic acid-containing drugs. J Pharmacol Exp Ther 264: 475-479. Krishnaswamy S, Duan SX, von Moltke LL, Greenblatt DJ, and Court MH (2003a) Validation of serotonin (5-hydroxtryptamine) as an in vitro substrate probe for human UDP-glucuronosyltransferase (UGT) 1A6. Drug Metab Dispos 31: 133-139. Krishnaswamy S, Duan SX, Von Moltke LL, Greenblatt DJ, Sudmeier JL, Bachovchin WW, and Court MH (2003b) Serotonin (5-hydroxytryptamine) glucuronidation in vitro: assay development, human liver microsome activities and species differences. Xenobiotica 33: 169-180. Levesque E, Beaulieu M, Hum DW, and Belanger A (1999) Characterization and substrate specificity of UGT2B4 (E458): a UDP-glucuronosyltransferase encoded by a polymorphic gene. Pharmacogenetics 9: 207-216. McLure JA, Miners JO, and Birkett DJ (2000) Nonspecific binding of drugs to human liver microsomes. Br J Clin Pharmacol 49: 453-461. Miners JO, Lillywhite KJ, and Birkett DJ (1988) In vitro evidence for the involvement of at least two forms of human liver UDP-glucuronosyltransferase in morphine 3-glucuronidation. Biochem Pharmacol 37: 2839-2845. Patten CJ, Code EL, Dehal SS, Gange PV, and Crespi CL (2001) Analysis of UGT enzyme levels in human liver microsomes using form specific anti-peptide antibodies, probe substrate activities and recombinant UGT enzymes (Abstract). Drug Metab Rev 33: 165. Rajaonarison JF, Lacarelle B, De Sousa G, Catalin J, and Rahmani R (1991) In vitro glucuronidation of 3′-azido-3′-deoxythymidine by human liver. Role of UDP-glucuronosyltransferase 2 form. Drug Metab Dispos 19: 809-815. Resetar A, Minick D, and Spector T (1991) Glucuronidation of 3′-azido-3′-deoxythymidine catalyzed by human liver UDP-glucuronosyltransferase. Significance of nucleoside hydrophobicity and inhibition by xenobiotics. Biochem Pharmacol 42: 559-568. Samokyszyn VM, Gall WE, Zawada G, Freyaldenhoven MA, Chen G, Mackenzie PI, Tephly TR, and Radominska-Pandya A (2000) 4-Hydroxyretinoic acid, a novel substrate for human liver microsomal UDP-glucuronosyltransferase(s) and recombinant UGT2B7. J Biol Chem 275: 6908-6914. Soars MG, Burchell B, and Riley RJ (2002) In vitro analysis of human drug glucuronidation and prediction of in vivo metabolic clearance. J Pharmacol Exp Ther 301: 382-390. Venkatakrishnan K, von Moltke LL, and Greenblatt DJ (2001) Human drug metabolism and the cytochromes P450: application and relevance of in vitro models. J Clin Pharmacol 41: 1149-1179. Yue Q, von Bahr C, Odar-Cederlof I, and Sawe J (1990) Glucuronidation of codeine and morphine in human liver and kidney microsomes: effect of inhibitors. Pharmacol Toxicol 66: 221-226.